Find Out How To Maximize Your Gain From One Of The Most In Demand Markets Today! Discover how you or anyone can easily and quickly monetize the health and wellness industry! Grab an eBook that talks about the beauty of this business and how you can tap into it even if you have no experience in marketing being an entreprenuer. Did you know that the baby boomers are retiring? They are part of the trillion dollar industry in America and who knows, the rest of the world. If you are in business, do you think you would want to market your products to this crowd? Well, let me shed some light on the facts the baby boomers are somewhere between 50-60 years old and there is one thing they would want more than anything else in the world besides money. Who the baby boomers are, what their behavioral patterns consist of, why they are an unstoppable market and how to position yourself as a merchant in front of them! How to predict the right trend and pick the best product line you wish to go into! Learn about the products that baby boomers will want to buy and how you can tap into unparalleled economic demand. How to build an effective low-cost model in without spending huge amounts of capital in the process. Why the network marketing industry is the best place to get started if you want to cash in big on the health and wellness industry. How to develop product awareness and get people to buy your product without selling it like a peddler. The right mindset you will need to succeed in this business! 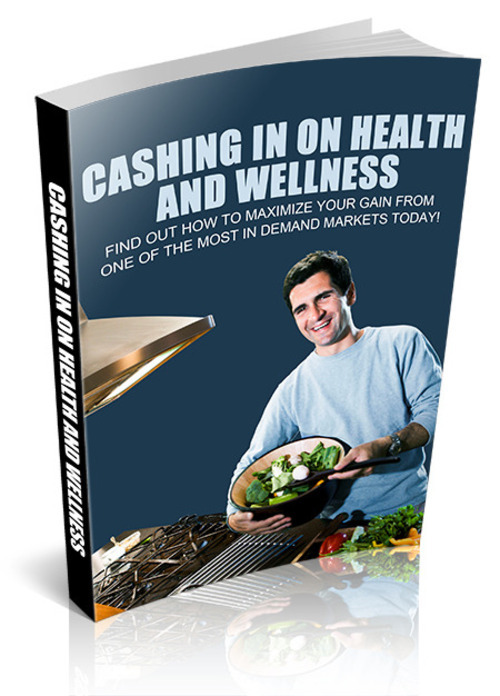 Cashing In Big On The Health And Wellness Industry Mrr! Fitness And Wellness For You, Mrr/giveaway Rights Included!